The week prior to an examination is a period of great stress for students. In order to avoid the pressure, it is important to follow a routine with sincerity that helps them prepare for exams well. Spending long hours in your study room does not guarantee a high score in exams at school, college or university level. So how can you make sure that you don’t have to spend sleepless nights before the exams? Here are some time-tested methods that you can follow to ensure that you prepare for exams in the best way possible for your upcoming results. The best way to study for an exam is to study in intervals. A study in 30-45 minute intervals with regular breaks in between prevents cramming. It will provide you with much-needed relaxation of mind. Studying in intervals can ensure a higher retention rate in your mind which may not be possible by cramming for long hours. Many students have the habit of having fun until a week before the exams and then attempting to mug up everything. This is a very wrong approach. It not just prevents you from getting the best result but also prevents you from gaining much. You need to approach an exam not just from the point of view of marks but also from the point of view of learning. You need to make sure that you gain knowledge in the learning process. Most of the textbooks at school and college level contain many questions at the end of the chapters that are not answered. You can set aside a specific time of the day when you solve these questions. This can be done a few days before the exam. 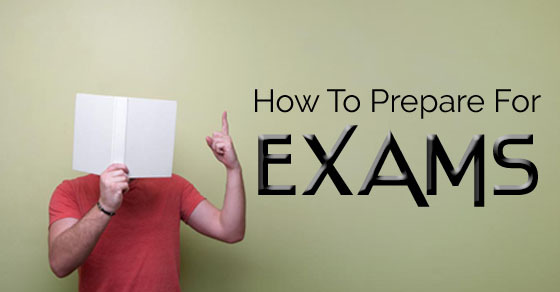 You can stay free from pre-exam tension by finding out what you know clearly. Self-evaluation prior to the exam gives you a clear picture of what you know and in what things you actually lack knowledge. If there are many questions related to the same topic that you are unable to answer, you need to learn that section all over again. Sometimes, in a hurry, you tend to miss out on the important sections of a chapter. Do not get tense or upset about it. Keep an open mind and study it from scratch. Add graphs, charts, questions and summaries wherever it is necessary. You can set a specific time for organizing lecture notes once the classes are over. Teachers take all the pains to create the most useful notes related to the subject. They try and summarise all the important parts of the chapter in the notes they dictate in class. You need to make sure you do not miss a single lecture in class. In case you miss a couple of lectures due to health or some other reasons, you must make sure you take down the notes later. There are chances that the teachers set exam papers based on these notes. Missing out on these could thus be foolish. Cramming is known to cause a lot of anxiety which impacts your ability to remember what you have studied. By following a proper study plan and schedule, you can study all important chapters and get satisfactory grades. Follow a proper routine on a regular basis. Make up your mind about the time period you will devote to each section you study. The best approach would be to set a timetable by allocating some time for each subject. You must make sure you allocate more time to subjects you despise or find difficult. Simpler subjects should be allocated lesser time. Prepare your timetable such that there is ample time for revision. Most students study all night for the exams, but this is not a wise thing to do. Recent research has confirmed that all night study has a negative impact on the memory and sense of reasoning which may lower the grades of a student. One wise trick that you can follow is to study the toughest chapter before going to bed. It will help you to recollect what you have studied during the exam. Therefore, avoid studying for 4-5 hours at a stretch. Sleep plays a vital role in keeping our brain intact. Every individual needs a fixed amount of sleep so that his brain functions properly. A grown-up adult requires 6 to 8 hours of sleep. Growing children may require a little more sleep. Cutting down on this sleep may mean health problems. Studying in a group can help you to review and compare notes with your friends. You can ask each other questions and discuss abstract concepts and also divide study tasks. Create a specific agenda and time frame for group study session so that your studies do not go off track. Group studies have many benefits. Firstly, it helps to enhance your interactive skills. In addition, it also helps to make the whole study process fun and enjoyable. There are many ways to make a group study session more interesting. You can divide the group into two and start a quiz contest. This is a great way to motivate others to join in. It will also avoid the feeling that you are studying since you are just playing a challenging brain game. You may be of the opinion that highlighting, revising and the summation is the best way to study for an exam. However, recent research by academic experts has shown that these are not the best ways to improve the performance of a student. You can spend time in practice tests through the use of flash cards which will prove to be an effective way to study before the exams. Practice tests are usually enjoyable. You may request your parents to create these tests for you. You must make sure you allow a specific time to do these tests. This way you will remain time conscious. It will help you solve the actual exams within the given time frame. There may be occasions when your teacher may advise you with a number of studying methods which can prove to be beneficial for you. To receive that type of assistance, you will need to make sure that you are present in your class regularly. Doing so is an effective approach as your final exams approach. You can also take the help of review sheets. It is said that 70% of the studies happens within the classroom premises. Paying attention helps you learn things easily without putting in any extra effort. It is also observed that children who while away their time in the class find it very difficult to study the same stuff all by themselves. So you need to pay attention in the class. If you have some doubts which are looming in your mind, one of the best things that you can do prior to the exams is to go to your teacher a few days before the start of your exam. Your teacher will make sure that all your doubts are clear at this point. So, you will be able to make sure that you have a clear perception of the concepts that you have studied before the exam. Teachers have been in their profession for a couple of years. They know how to simplify the subject for the student. It is thus a great idea to approach the teacher if you have any queries or doubts. Make sure you get them solved from the teachers prior to the exam. Try to relate the topics you study with your life, social problems, class-related problems etc. It will help you to clear any doubts at the last minute. You need to make the best use of the study material given to you. You need to think and devise ways to simplify the subject. One way is to make a story out of what you learn. This is an easier way to remember especially in the case of history lessons and chronological orders. In places where the sequence is of importance, creating a story can be extremely helpful. Many times, children have the habit of leaving the studies for some later date. This kind of procrastination often causes the student to leave out certain sections of the subject. This is not a good idea. A better approach would be to complete what has been taught in class on the same day. This habit will ensure that you are free on your holidays to have some fun. You need to strictly avoid procrastination. You should also take special effort to manage the time properly. The proper study habit right from childhood ensures that the child grows up to be a responsible and sensible adult.